Hi, I am Captain Greg Buckner, one of the youngest Captains on the Bay. I have dedicated this part of my website to telling you a few things about myself. I was born and raised in St. Mary’s County, MD and have enjoyed fishing local waters most of my life. After my freshman year at St. Mary’s Ryken High School I found my first job in the fishing business at The Tackle Box (the local tackle shop) where I learned about all types and methods of fishing. After graduating from high school I decided to attend St. Mary’s College of Maryland where I lived on campus which allowed me to continue working at the Tackle Box and fish local waters. At the end of my freshman year at St. Mary’s College a position as a first mate became available on a local charter boat, working for Captain Greg Madjeski aboard the Temple M. I took the position and have been in the Chesapeake Bay charter fishing business ever since. After my first season aboard the Temple M and various other charter boats out of the Ridge, MD area I started to look for a local Captain who needed a full-time first mate. After an interesting search I came across Capt. John Montgomery aboard the Miss Susie out of Solomons, MD. I worked with Capt. John for the next two seasons as a full-time first mate as I continued my education at SMCM. After these two seasons Capt. John persuaded me to get my U.S. Coast Guard Captain’s license so I would be able to run the Miss Susie when he needed days off. I received my U.S. Coast Guard 50 ton master’s license one month after receiving my Bachelor of Arts degree in Economics from SMCM. For my third and fourth season aboard the Miss Susie I worked as a full time mate for Capt. John and whenever he needed a day off I Captained the boat, an arrangement that worked very well because I knew the boat and his clientele. Just days before the 2004 Striped Bass trophy season (my fifth season on the Miss Susie) Capt. John had big news… He was moving to Syracuse, NY and was selling the Miss Susie and his charter business, and wanted to know if I would be interested in buying the boat and business. I of course, absolutely loving this line of work, said yes. On June 1, 2004 I became the proud owner of Miss Susie Charters. Since then things have gone very well with a rapidly growing customer base and a very busy schedule and great fishing. During the fall of 2007, I expanded my business and purchased FIN FINDER Charters from Capt. Sonney Forrest. 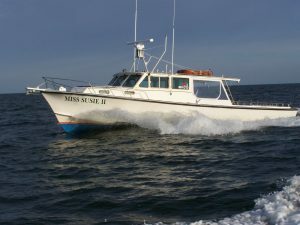 The FIN FINDER is a beautiful 46ft Markley which allows us to fish the Virginia Beach Winter Striper season and also offer two very nice boats for our customers fishing out of Solomons. In 2011, I took the original Miss Susie out of service and converted the FIN FINDER into Miss Susie II. In a partnership with Capt. Lee Tippett a 46 ft x 16 ft Carmen Charter boat (FIN FINDER II) was brought into the fleet to carry the Fin Finder Charters customers. P.S. Yes, I am a young Captain (being born in 1980) but because of the many hours on the Bay over the past 16 years (an average of 300 trips per year) I do have a tremendous amount of experience and promise my clients will have the best possible chance of a successful day of fishing. Also, the guidance and help from so many talented Captains I worked for has put me where I am today. Each one of them has helped me in some way and I am overwhelmingly thankful for their help and guidance. They are: Capt. Greg Madjeski, Capt. Stan Harris, Capt. Charlie Nicholson, Capt. Gary Sacks, Capt. Jim Smith, Capt. Hank Conley, Capt. Sonny Forest, Capt. Wally Williams, Capt. Charlie Marenka, Capt. Danny Pritchett, Capt. Ronnie Scott, Capt. Tom Ireland, Capt. Lee Peters, and Capt. Jim Ekas. And a very special thanks to Captain John Montgomery who has taught me so much more than just how to catch fish, like how to treat customers and how to run a top-notch charter fishing operation. Thanks for everything!